For nearly six years, “Mr. 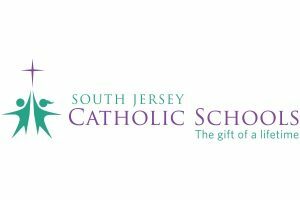 Bernie” Griffin has made Saint Joseph Regional School in Somers Point shine. He’s an early riser, a hard worker, a generous colleague and a loyal fan of the school. Griffin wakes up at 4 a.m., without an alarm clock, and arrives at the school by 5. He likes to settle in, read the paper and watch the news until his work day starts at 6. By the time school begins, Griffin has cleaned and replenished supplies in the bathrooms, raised the flag, set up the gym for morning assembly, put out cones for the car line, brought in the milk and made coffee for the teachers. “I get along with all the teachers. I’m more than happy to do what I can to help make their day a little easier,” he said. Griffin’s generosity does not go unnoticed. Principal Dr. Janice Fipp caused him to blush behind his well- groomed white beard when she mentioned the high-end pastries he brings for teachers many Fridays. “I’m in early so I know there’s nobody else here but Bernie,” she said, referring to the fact that the pastries simply appear, with no note. “Well they gotta have something with their coffee,” Griffin said. With an arm brace and knee pads for protection, Griffin said he never stops moving during a typical work day, which ends at 2 p.m. (3 on Fridays). “I like to come in early … get my work done and be home at a decent time,” he said, although getting home usually involves a detour to another job, such as landscaping, power washing or painting. “Anything to make a couple extra bucks,” said Griffin. Home is a neighborhood with friends who are like family, some of whom he helps regularly. If there is extra food from the school lunch, Griffin brings it to needy neighbors. He said he hates to see food get thrown out, especially when he knows people who can use it. Eighth of 10 children, Griffin remains close with his siblings and is Uncle Bernie to “about 20” nieces and nephews. Scattered on both sides of the Delaware River, the siblings make sure their mother, who recently moved back to the area from Florida, is well cared for. Fipp marveled at the way Griffin’s family pulled together during their mother’s recent battle with cancer. “When she really needed him last winter, I’d ask if he needed time, but he’d say, ‘I’ve got the weekend,’” she recalled. “You’ve gotta come together. That’s what family’s all about,” said Griffin. Griffin still mourns the loss of his father, who died six years ago, but said he is grateful every day that his father “bugged him” to apply for the job at Saint Joseph. After years of construction work, Griffin said he is happy to have a full-time position with health insurance and protection from the sun. And he loves the Saint Joseph Regional School community. Griffin said he feels close to school families, too, and gets invitations to ball games and graduation parties. The students ask him to sign their yearbooks. And he was a standout Underdog, complete with the mask, at the pre-Super Bowl pep rally in celebration of the Eagles. Catholic schools would not survive without their Bernie Griffins: the individuals who work behind the scenes to clean the building and keep major systems in order, prepare and serve lunch, answer phones, make sure records are up to date, manage the mail, mow the grass and trim the hedges, order books and supplies — and get the coffee started. Summertime may be quiet without the bustling activity of students and teachers, but for Griffin it’s the time to take cleaning to another plane. “Last day of school I say good-bye to the kids and I’m out the door for [a week] of vacation. 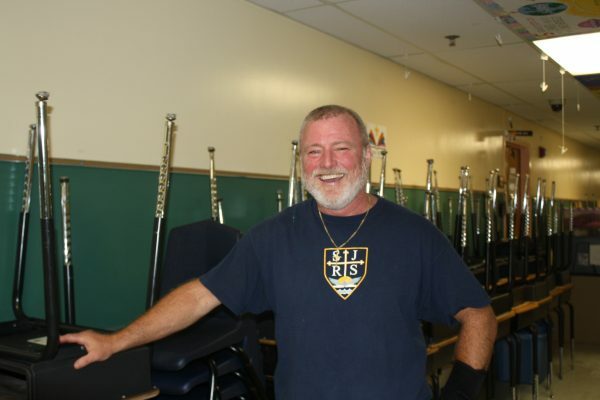 I come back and start to empty out every classroom, one by one,” he said. He removes all furniture, cleans the room, then sweeps and strips the floors. Next come five coats of wax. “Then all that furniture’s gotta go back in and you move on to the next room,” he said. When the students and teachers return, Griffin will have deep-cleaned 30 rooms, two hallways, a kitchen and all bathrooms. And he will have painted and made repairs — some inside and some outside. By summer’s end, he will need new shoes and sneakers. “I’ll do whatever I can to help this place keep going,” he said.